Apparently there's a program on my laptop that enables one to draw pictures and whatnot: Windows Paint. Oh. So that's what that program does. Who knew? Well, apparently my 8-yr-old did. Not only did Rhyinn know how to use the program, but she saved all sorts of lovely pictures over the last two weeks. Lots of all sorts. Even more than what you think "lots" means. My favorite one, though, is the blog post header. It's a self-portrait. Interesting that of all the words that sprung from her heart the day she created this was Dance. Why? Because she longs to dance, to delight in her world. Years ago, George Eliot wrote: "It seems to me we can never give up longing and wishing while we are alive. There are certain things we feel are beautiful and good, and we must hunger for them." The world being it is, we know we can't have everything we long for. So we create Bucket Lists. Someday I'd like to . . . Before I die, I'm going to . . . What I've always wanted to do was . . . The world also being it is, we often lose hope that we'll ever have or do what we long for. Have you ever despised hope? When I was a kid, for my 12th birthday I desperately wanted . . . funny thing is I can't remember what it was I had wanted. But I didn't get it. Even after telling my parents over and over and over. Probably was something unrealistic and "too expensive," like a horse or an Atari. Instead I got a Family Feud board game. My parents had a camper at the time and Mom had left the game unwrapped in the sleeper part over the hood of the truck. I had to get something out of the camper and accidentally came across my gift. I cried and cried and cried and cried some more. But I didn't want to hurt my mom's feelings so at my party when I opened the package, I acted all thrilled. I wonder if that was the first time I learned to begin despising hope, or at least learned to live with disappointment. Trust me, being a writer seeking publication, one has to find that balance between not having unreasonable expectations and not giving up hope that one day we'll achieve our dream. In the twelve years I've been writing, I've quit writing a good dozen times because rejections and disappointment and hope deferred hurt to much. Yet I still longed (still long) to achieve my dream. "The problem with desire is, you want everything" Paul Simon once said. I have to agree. Look at my Christmas list. Two months ago if you asked me if I wanted anything, I would have said, "No, not really. I'm pretty content." But then I was asked for the JAG Welborn 2011 Christmas List. Not only did my kids want lots and lots of things, I started thinking of a couple things I wanted. That couple turned into a few which turned into a lot. The top WANT is stainless steel measuring cups and spoons. Oh, not those cheap ones you get at Wal-Mart or Bed, Bath & Beyond. No, I want the $50 All-Clad ones. Yes, I know! $50 for four measuring cups is ridiculous. So I googled to find cheaper yet comparable quality ones. Eeeks! I am giddy as I share. Williams-Sonoma sells an online exclusive boxed set for $27 and and for an additional $21, you can get the odd boxed set. I don't just want both. I need them. My life would be happier with them in my kitchen. I like to cook but I'd like to cook even more if I owned them. Thus I deleted practically everything else off my Gina's Wish List and replaced it with these. Yes, I may have even put a few !!!!!!!! after the item name. I know you're probably thinking, "Gina, you're being ridiculous yearning for William-Sonoma Stainless-Steel Measuring Cups and Spoons boxed sets for the online exclusive price of $27 and $21 respectively. You don't need these to be happy." I yearn for them sooooo much that I've repeatedly filled out the online order form, but only stopped short of buying because I had no money. "We come into the world longing," says Gil Bailie, "for we know not what. We are desire. And desire is good . . ."
Exactly. My desire for the stainless steel measuring cups and spoons is good. Having them in my life will bring me happiness even if it's only temporary. And God wants me to be happy. Not just happy. He wants me to have life to it's fullest. "We come into the world longing," says Gil Bailie, "for we know not what. We are desire. And desire is good, for it's what takes us to God. But our desire is not hard-wired to God." Sometimes it's seems like God has gone/is going to great lengths to thwart the very thing(s) that I know I deeply want, that I know will bring me happiness, that I know I'm doing because I want to bring Him honor and glory. I wrote for eleven years completing six full manuscripts, and what finally sold was an unwritten novella that came with three other well established authors. Talk about feeling like I'm riding someone's coattails. We can make idols of anything. Quite often a good thing. Family. Church. Ministry. Worship. Serving others. Jobs. Pets. Children. Writing. Getting published. Williams-Sonoma Stainless Steel Measuring Cups and Spoons boxed sets for the online exclusive price of $27 and $21. "We are desire. And desire is good, for it's what takes us to God." In his book, The Journey of Desire, John Eldredge writes . . . When we don't look for God as our true life, our desire for him spills over into our other desires, giving them an ultimacy and urgency they were never intended to bear. We becoem desperate, grapsing and arranging and worrying over all kinds of things, and once we get them, they end up ruling us. It's the difference between wants and needs. All we truly need is God. Prone to wander from him, we find we need all sorts of other things. Our desire becomes insatiable because we've taken our longing for the Infinite and placed it on finite things. . . . All the other desires find their place as we give God his place. That is why the psalmist urges us, "Delight yourself in the LORD and he will give you the desires of your heart" (Ps. 37:4 NIV). Only as we truly delight in God is it safe to give us our desires, for then they are not likely to become idols. Suddenly I don't yearn so much for those measuring cups and spoons because as long as I yearn to have _____ in my life to be happy, I'll never really be happy. Death sees to that. King David wrote: "I have stilled and quieted my soul. . ." He learned to wait. Desire at rest. Of all good things in heaven. Someday I am going to have the most amazing measuring cups and spoons for all of eternity. Well, given our chats in the secret underground Inky headquarters, you know I admit to obsessiveness -about writing...but the list goes on. How many times do I tell myself that I should be dreaming more of what I can do for Christ. Oh, but we are so ...ugh... you expressed it well. Maybe it's that spot we are supposed to fill up with God that we fill up with other things. Or just fill up with busyness. But rather than go on about my shortfalls, I'll go with Rhyinn and say DANCE. I hope you dance today. Feeling particularly Scroogey this week, I found the cure: Mariah Carey singing All I Want for Christmas is You. Who can sit still during that one? Dance. Because as much as we need to recognize where our dreams and desires go askew, we can't let that steal the joy that He wants us to have in this life as well. The John Eldridge quote really spoke to me today. Thanks, Gina. Loved the pictures too. Like Dina, the Eldredge quote ministered to me. Thanks Gina. I listened to someone recently saying we can have it all, just not at the same time. I'm not sure I entirely agree. The desire to have it all just might not be as "healthy" as the world believes. Umm Gina... I have the stainless steel Walmart ones. And I like them. Gina, your post has blessed me in a way you can't even imagine. I'm in the process of filling out my proposal info for the novella I'm working on with the other Pony Express ladies and I've been praying for days for a pertinent Bible verse. And out of the blue, I remembered to check the Inkwell and bang - Proverbs 13:12 is the perfect verse. THANK YOU. And congrats on your novella. Two months to go. Yay! Deb, I heard a George Michel Christmas song yesterday in the car and had fun singing along. Thankfully none of my kids were with me. It wasn't the best Christmas song nor Christ-focused, but I was happy to hear something on the radio that didn't make me cry. LOL. Lisa, I know what you mean about having it all. Even if I did, I'd still see something and want it. Which proves that my thirst is only going to be sated in Jesus. And even then it's only a thirst at rest because the deepest longing of my heart is eternity with him. Oh, Anita, I'm so glad that my post provided you the right verse for your Pony Express novella. Still sad I had to drop out of that one. :-( But I'm praying it sells. Thanks for the tip on putting cornmeal on my pizza stone. Nice! I'll try that. Gina, that's a double blessing you've given me. But you were right about one thing... the research is ridiculous. And since only 2 remotely topical books were in my whole provincial library system, I've spent $100 buying PE books not including the the shipping to ND, gas to drive down, and $38 for tax to border customs. I ensured I only bought books I could use for other wips and since my personal library only contained books from the last quarter of the 19th century, all these from 1850 onward are a treasure. I think I've said it before in emails and in St Louis, but whether or not the novella sells, I'm indebted to you and encouraged by your faith in my ability to carry it through. You're a blessing to me, Gina. Thank you. 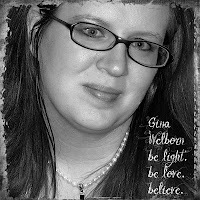 Fabulous post, Gina. I could relate and I was blessed by your words. I started out not wanting a thing for Christmas, either. I don't need anything, I'm fine. And then I thought, well, hmm, okay, well yes...I ogled a purse. An expensive purse. And scarves to update my wardrobe. And eye cream that's supposed to make me look less frazzled and puffy. Ah, vanity and desire. Those quotes are keepers, and I loved the pics. Thanks. Susie let me know about the eye cream, okay? Anita, I can't believe the craft of writing book hadn't arrived yes. Oh, media mail is getting slooooo this year. Ooh, tell me about this fabulous eye cream. I spent $ from my grandmother-in-law on Elizabeth Arden makeup. Major splurge gift. However, to justify the purchase I will say that my wrinkles have diminished since using the skin care products. Gina, I loved this, and I love Rhyinn's drawings. Especially the dancing one. I love children's artwork so much. Thank you for blessing me, Gina. Oh, Gina, I HAVE those measuring cups. Those exact ones. Both sets. But only because my boss's dear wife gave me a W-S gift certificate for Christmas a while back. I would NEVER buy something like that for myself. But they're beautiful and elegant. The eye cream...I misspoke, because it's actually an eye mask. It was used on me once in a mini-facial almost a year ago, but I thought I looked better afterwards. It's Elemis Absolute Eye Mask. I don't own it, but it's one of those vain things I think about splurging on. If I got it, of course, I'd probably want to also get the Elemis Pro Collagen Eye Renewal.